The grounds at St. Mary’s Home for Disabled Children were already beautiful, with a number of local garden clubs having worked hard to enhance the landscaping in the gardens and courtyards. Over the summer, though, something new blossomed in the butterfly garden: a 500-gallon pond complete with waterfalls. You can learn more about the project in an article that ran in The Virginian-Pilot on Sunday, Sept. 20. The article also is available here. Ron Herrick, the facility maintenance manager, designed the pond and installed it with help from his crew. Norfolk’s Harborfront Garden Club provided money to build the pond, while the parents of some residents donated koi for the pond. Residents can go outside, of course, to enjoy the serene scene, but they also can see the pond through the window as they pass through a main hallway. And they can listen to the waterfall by pressing a large button beneath the window to play a recording of the rushing water, thanks to the efforts of Mamie McCloud, an occupational therapy technician. You can help save lives by taking part in the latest St. Mary’s Day of Life on Friday, Oct. 2, at the Red Cross, 250 W. Brambleton Ave., Norfolk. Please join St. Mary’s staff and teachers, as well as families of St. Mary’s residents, as they donate platelets. Cancer and organ transplant patients need platelet transfusions to help their blood clot, preventing massive blood loss. Contact Soozi McLain, head of St. Mary’s physical therapy department, at (757) 622-2208 ext. 346 or smclain@smhdc.org to find out more about St. Mary’s Day of Life. 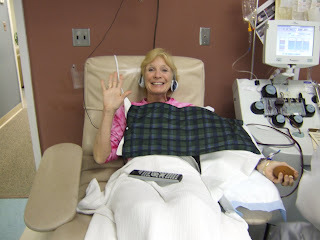 That’s Soozi above, demonstrating how easy it is to donate platelets during a previous St. Mary’s Day of Life (photo by Kathy Brobst, physical therapist assistant). Only one arm is used for platelet donation, and you can bring a DVD to watch on your own private TV. St. Mary’s physical therapy department coordinates platelet donation about every three months. The department already has succeeded in filling eight spots together in the morning on Oct. 2, but you can sign up for any time during the entire day. For more information about donating platelets, see this Red Cross website. Please join us on Saturday, Oct. 3, at Fort Story in Virginia Beach for St. Mary’s 21st Annual 5K Run/Walk, plus One-Mile Fun Run. Proceeds support the programs and services of St. Mary’s Home for Disabled Children. See our website for more information or to register.